This clump of hellebores (Helleborus orientalis) started to open up a week or so ago, towards the end of April this year. But I could see the flower buds marshalling for the big push under the leaves as early as March. That’s why a common name for this flower is the Lenten rose, because it flowers in early spring, near Easter. Of course, the flowering period is more accurately “Lenten” in milder climates like the UK. Hellebores were the fleur du jour a few years ago. Funny how a certain flower suddenly becomes trendy. I think I got mine on the leading cusp of that trend, but I can’t recall really. I just liked them because they’re so Englishy. It’s a shame the flowers tend to be of the nodding variety. But perhaps it’s good for us, sometimes, to lie down on the ground and look upward at your garden, as I had to do to capture the picture above. Otherwise, all I might ever see would be the tops of their sweet little heads. 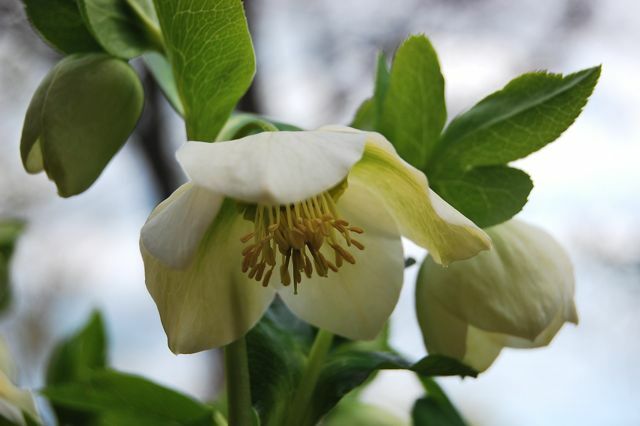 How long will hellebores manage to co-exist with the Norway’s roots? I love them, but they are not cheap and so I’ve resisted purchasing any for fear that they would be a big investment for just a year or two of pleasure. Rose — Garden journals are good things to have sometimes. 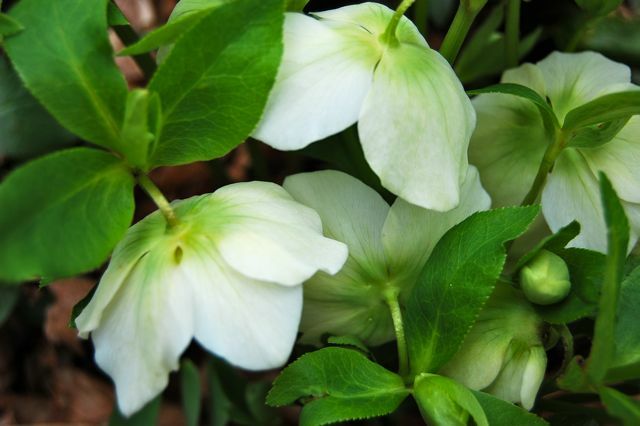 I went back to mine and saw that I purchased my white hellebore in 2001 — so it’s eight years old this year, and has increased, though slowly, every year. Thanks Helen! Eight years is a commitment I can make! I just hate to plunk down all that cash (and hope) for the hellebores only to have the maple squish them in two years time, just as they are starting to get going. How’s this as a substitute for boxwood?